This week I picked up 'Glamour' magazine and whilst having a good read through, I came across a freebie (I love the excitement of finding them!) 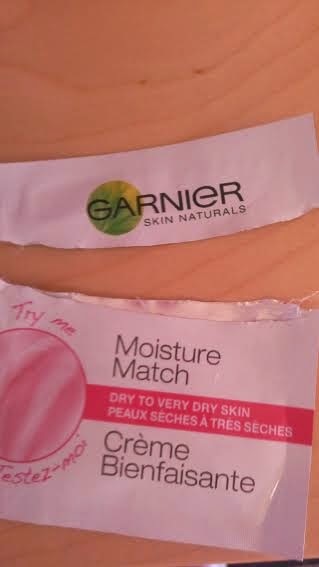 This month the freebie that turned up was the 'Garnier Moisture Match'. 'Garnier Moisture Match' are a range of five different moisturisers by Garnier designed with differing skin types in mind. Genius! The five different types of moisturiser all have varying textures and sensations dependent on what requirements your skin has and all work over a 24 hour period. ......Anyway, overall I was pleasantly surprised with this moisturiser as it worked wonders on my dry skin to make it silky and smooth and it is already on my 'to buy' list, and with five different types of moisturiser for a wide spectrum of skin types there is something for everybody. It's so refreshing that Garnier have acknowledged that not everyone's skin is the same! Have you ever tried Garnier's Moisture Match? Let me know!